It has been a week since we have returned from your beautiful country. We are reeling in the excitement and splendor of it all. Just want to let you know we were very pleased with our accommodations and car rental that you arranged for us. We must admit it was quite nice to be all prepaid as we travelled and were welcomed at each and every place as we went along. The B & B’s were all outstanding and our hotels in Dublin and Killarney were superb. The Abbyglen Castle Hotel was truly exciting and perfect timing near the end of our trip. The Irish people are the most friendly people we have ever met. If we were standing on a street corner looking at a map, surely someone would stop to try to help us find what we were looking for. One day in a grocery store we were looking for some pharmaceutical item and the store did not carry it and a lady actually left the store to show us where the pharmacy was. Our biggest challenge was in driving on the opposite side of the road from what we are used to. We were truly impressed with the Dingle Peninsula and the Cliffs of Moher. We were blessed with great weather and abundant sunshine. Most rain was overnight and only one day did we actually get slightly rained on. People have commented on our pictures showing blue skies and sunshine. Thanks again for arranging our stays and car rental while in Ireland. WOW!! What a FANTASTIC trip you organized for us! We adored our time in your beautiful and kind-mannered country and now experiencing a severe case of vacation blues (or should I say vacation “greens”?!) A big compliment and thank you for making our trip most enjoyable and convenient. We loved waking up every day not worrying about where we were going, how we would get there, where we were sleeping and standing in lines for tickets. Your attention to detail did not go unnoticed and it contributed to us fully enjoying our limited time in Ireland – without any family arguments, ha! We would also like to give a big appreciation and thank you to our driver and tour guide, Gordon. He was a delightful and patient man, full of helpful knowledge which also made the trip all the better. The itinerary you put together was superb, we thoroughly enjoyed it. And we must’ve really lucked out with the weather, as we rarely encountered rainy, cloudy days. The Luck of the Irish was with us! 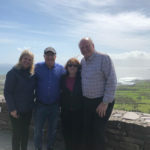 Each location was more beautiful than the last with our favorites being the Cliffs of Moher, Ring of Kerry and the Dingle Peninsula. But probably our most memorable day was in Galway, feeding the baby lambs and watching the sheep dog demonstrations at Killary Sheep Farm http://www.killarysheepfarm.com/index.php. I would highly recommend including this farm on your activity list for future customers. Again, Deborah, job well done! We will be sharing your information and services with others and we look forward to visiting you beautiful country again soon!! My husband, Paul and I wanted to send you our deepest appreciation for helping us to plan such a memorable experience in Ireland for our Honeymoon! We had a beyond amazing adventure traveling Ireland!!! We didn’t have any discrepancies with any of our hotel and bed and breakfast stays, all the accommodations were beautiful and beyond our expectations. They were perfectly localized in the areas we wanted to visit! We hope to send some of our friends to Ireland and to work with Go Irish Tours, you made traveling so painless! Thank you so much for tour help!! My daughter and I wanted to take our first trip out of the United States, and we both agreed Ireland was the place to go. So I found Go Irish Tours online, and saw that they help you plan out your self-drive trips. So I sent them an email detailing my idea of the perfect trip to Ireland. I was so happy when Deborah contacted me back and we starting discussing my upcoming trip. She helped me to not only plan my trip but made sure that we would be able to see the major spots we wanted to visit. Never being to Ireland I wasn’t sure the distance between locations, and Deborah was there to let me know if driving from one spot to the other was doable. Gave me alternatives to pick from, helped me with flights, and even calmed my nerves down when I started to get nervous about driving in another country. I didn’t feel like I was working with a travel agent, I felt like I had a friend helping me. My daughter and I LOVE Ireland, can’t wait to go back. This trip was so amazing for the both of us. Thank you so much Deborah for all your help. I hope you know how greatly appreciated you are. Crystal – Pennsylvania, United States. Thank you for the personal follow-up. We had an amazing trip to Ireland. We toured castles, abbeys, tower houses and cathedrals. We saw incredible and varied landscapes (I didn't know Ireland had mountains), drove on the left side of the road and returned the car without a scratch, and fell in love with the charming town of Killarney. We ate too much bread and drank way too much Guinness, and spent more money than we planned, BUT we had the vacation of a lifetime! We are already planning another trip back to Ireland and will contact Deborah when the time is right. The small disruption Ophelia caused us pales in comparison to the souls who lost their lives and all the property that was damaged. I hope repairs will not take too long or cause a severe financial hardship on those affected, and that the families of the people who were killed are finding a way to heal from their sudden and tragic loss. Just wanted you to know what a great time we had in Ireland and thank you all for the hard work all the girls (Emily, Claire and Deborah) put in to make our trip a dream come true, Go Irish Tours will be highly recommended by all of us girls. Everything was just perfect and went on without a hitch, we walked into every place we were staying and were in our rooms within 5 minutes - amazing! All done by Go Irish Tours. Most of all we want you to know the Dave Nolan is the best, he made our trip all that it was and then some. He was always there for our every need and so full of knowledge to share and his love for Ireland. We cannot even imagine coming back to Ireland without having Dave as our driver. He was the absolute best, please let him know how much we appreciated him as our driver. We were all sad to leave him, he was like our family. We left the Saturday before the hurricane that hit, hope this finds you all well and things back to normal. Thanks again so much for such an incredible week! My Mom and I returned last weekend from a FANTASTIC vacation!!! Just in time to avoid the hurricane. J We were only in Dublin on Saturday, so we were unable to stop and visit. We had a wonderful time based on the trip that you arranged for us. It went so smoothly and everyone was super great. We were even able to have time to see a few more places that we were not sure if we would have had time to see. We really appreciate all the advice and booking you did for us. It was an enjoyable time and you made it that way!! We both indicated Ireland would be a place to return. Bless you!! Good morning everyone. I've just returned from my 5 day trip to your beautiful Ireland and I had to write you and tell you what a wonderful driver we had. Ed Doherty made our vacation wonderful. His warm personality and Irish wit was so enjoyable. He made suggestions about places he thought we would be interested in and he was oh so right. His knowledge of the history of Ireland was an added plus. He even told me how and where to write for more information on my great, great grandparents the Shannons and Noonans. I could not thank him enough for that. When I arrived Thursday morning October 5th. Ed Doherty was a stranger but the day we left he was a new friend. Your company and Ed will be my recommendation to anyone who has future plans to visit Ireland. Please tell him thanks for everything. My trip is a lasting memory that will never leave me. Hi Claire! I just wanted to say Thank You so much for the tour that you set up for my Mom, her friends and I. This was a trip that I had wanted to take my mother on for a long time and it far exceeded our expectations!!! The accommodations and itinerary that you set up were perfect and exactly what we were looking for! Our driver, Eddie Doherty was amazing! We laughed so hard with him throughout the trip and are still laughing today! He was kind, knowledgeable and did everything he could to make our trip perfect! We will definitely be back and will use Go Irish Tours again! Thank you again! These are memories with my mom that will last a lifetime! Hi! We just got back from our lreland Adventure! (9/11-9/18) It was an amazing family trip! was extremely knowledgeable, respectful, and kind!!! Our trip would not have been as spectacular, (we believe) if not for Seamus!!! The love & knowledge of his country showed thru with pride & excellence!!! We will be back to Ireland, (Go Irish Tours) for employing such a remarkable man!!! Thank you!!! PS! Would love to give feedback in regards to our hotels & B&B & itinerary! Please reach out, ty! Well Claire, we are back from a trip that will live in our hearts forever. We managed not to crash into anything or anybody, but a few close calls experienced! All the B & B's were very good and I would recommend them to anybody. You do have a beautiful country there! All the anticipation of a good time came true. We cannot say enough about Ireland and the Irish people. What a privilege to be among them. Go Irish and especially you, Claire, made our holiday beautiful! Hopefully we will meet somewhere down the road! Just a quick note to say thank you! My husband and I loved our visit and the places that were booked from your company. We were very happy that we drove up to the Giant's Causeway although we chose not to stay in the area. It was totally worth the relatively short drive (about 3 hrs each way). Our least favourite place to stay was in Galway but everywhere else was great. We would definitely return and could not have had such a fantastic trip without your help. We just arrived home Saturday night and I wanted to tell you that we had an amazing time in Ireland. Not only is your country incredibly beautiful but we got to see so much of it and the people could not have been kinder. Our drivers name was John Murray and he gave us lots of history and a lots of humor and he took such great care of us. We ended up being a group of 13 people and we all got along beautifully. All the hotels were very comfortable and the food was truly good. I will be sure to tell my friends about your tours and thank you again for all your assistance in making this a memorable vacation. Just wanted to check back in with you after our trip. I really want to thank you for ALL your help Everything worked out great! All the hotels were in great locations and were very nice. Everyone loved the stay at the castle and it was fun just to say we stayed in a castle one night. Our hotel in Navan was very nice except for the noise and water issues in the bathrooms. There was live entertainment both Friday and Saturday nights creating a lot of street noise with people partying hard into the early morning hours. In the bathrooms most people had a lot of problems with either having only cold or hot water, a lot of the time having only hot water making it too hot to even get in the shower. The other comment I had was the location of the hotel. There really was nothing to do in the town of Navan. We were grateful we could go back in to Dublin on Saturday to keep ourselves busy and continuing to explore Ireland. I just wanted you to know this for future bookings. All the other hotels worked out fine. I will say ALL of the employees we encountered were very nice and accommodating in ALL the hotels. Prosper was a great bus driver but not a tour guide in any way. He stated a few times he was never a guide just a driver. I'm glad I called because Robbie saved the trip!!! Prosper was a kind gentleman but Robbie was awesome in every way!!! He truly turned the trip around and immediately became family with all of us. Whoever made the call to have Robbie take over I would truly like to thank them. I can't imagine there would be anyone better. Finally, we all LOVED IRELAND. It is a beautiful country with wonderful people. It is clean and green every where! And we only had one morning of rain!! Unbelievable! (thanks for ordering the great weather up for us hehehe) The scenery was more than we dreamed it would be. I'm sure we'll be returning to the places we liked the best and the places we wish we had more time in. My sister in law and her daughter are already planning on returning next summer. I can't wait to make my book on shutterfly with all my memories. Thank you again for your help in making our trip flow smoothly. I wish you the best and much happiness. Take care and enjoy the day! We all loved our trip to your beautiful island! The tour exceeded our expectations and awakened our enthusiasm and interest of the Irish culture, history and people. Thanks for all the work you put into making this such a wonderful experience for us! We just returned from our trip and I wanted to thank you. We had such an amazing experience and thoroughly enjoyed our time in Ireland! Exploring the countryside was beyond words and I really appreciate your recommendation of only staying one night in Dublin. I definitely want to give a kudos to Killaran House B&B in Killarney. That was our favorite stay and the host gave us spot on recommendations! They were absolutely wonderful! We are already talking about a return visit and can't wait to see all that we couldn't fit in on this trip. I just wanted to write and tell you what a truly wonderful experience we had with your company. The tour was fabulous and especially our driver Kieran Harten made the trip so memorable. He was FANTASTIC! The accommodations were all pretty wonderful - although we weren't crazy about the Oakwood Arms hotel - seemed more like an airport hotel than the other quaint older establishments you housed us in. But it certainly was adequate for our needs. Thanks again for all your help. I was so nervous that it would all pull together, but I certainly had no reason to be. Everything went off without a hitch.? I would not hesitate to recommend you or your company to friends in the future! I wanted to touch base with you in regard to our recent tour through Ireland. We had the most pleasant experience and our trip exceeded all of our expectations. A huge part of the success of our trip was definitely due to our driver Seamus. We knew that booking our trip with a guided tour and driver was going to be a big asset, but our driver Seamus made the trip that much more enjoyable. By the end of the trip we all felt like we had made a friend for life. Not only did Seamus make sure that our itinerary ran smoothly and that we arrived at all our hotel and event destinations on time and relaxed, but he was the utmost professional in getting us there safely. His priority in keeping the bus in order and making sure his passengers were safe was something my husband and I took notice to. He is a true professional. The wealth of information about Ireland that he was able to share with us all was invaluable and I cant think of one questions he was not able to answer throughout all the different counties of Ireland we passed through. He made us feel like we were a part of the culture. He was personable, pleasant, courteous and always greeted us with a smile and positive attitude, no matter how early in the morning we were all stepping onto the van! Not only would I recommend GO IRISH TOURS to my friends and family, but I would definitely recommend them to request Seamus as the driver. We hope to return to Ireland and we will definitely be requesting Seamus for our next trip. Thank you so much for everything and we hope to do business with you again in the future. Please forward this to the necessary people so that Seamus will get the recognition that he deserves. just a short note to thank you and Go Irish for a great time for my family and I on our recent trip to Ireland. We got the promised tour and had a even better experience because of Robbie Barr our driver and guide. As you well know, the guide makes all the difference on a small group and he was outstanding. So our family made great memories together and really that is the end game on this kind of a trip! Thank you for setting up nice places to stay and your personal attention to our Ireland family adventure! 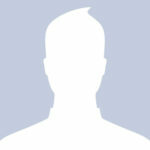 Hi Emily, I just wanted to send you a quick message to thank you so very much. We had an absolutely amazing time. It was everything I had dreamed of and more. The weather was perfect, and thanks to you everything went so smoothly. All the places you picked for us to stay were wonderful. The only thing I would change was to stay a few more days!!! Thank you again. I just wanted to make you and your team aware of Seamus and his impeccable customer service!!! He was not just knowledgeable of Ireland's history but beyond welcoming and entertaining. We have spent over 9 months planning this trip and although Seamus' wasn't originally part of our plan we know we wouldn't have had as great of a time without him. My husband and I have travelled to Korea, multiple European countries as well as Mexico and Costa Rica and Seamus is by far the only tour guide we will forever remember on this trip. He was always punctual, safe on the roads with such a huge van, and his personal experiences really helped us understand and embrace this amazing country. We will definitely recommend Seamus to all our friends and family that are planning a future trip! We wanted to make sure your company was aware of how fabulous Seamus is at his job! He was not only extremely pleasant but beyond knowledgeable concerning Ireland and its entire culture. My family and I have dreamed of seeing Ireland for decades and Seamus' personal experiences really helped us understand where our ancestors came from as well as maintain the pride in our heritage! We have taken several types of tours in various places and he is by far the most memorable with his punctuality as well as personality. We will definitely recommend any friends to look up and request Seamus for future trips since we know our trip would not have been the same without him. Thank you for hiring such pleasant and competent staff members in order to complete our wonderful vacation! I just wanted to take a minute to say Thank You!!! My Mom and I got back from our trip to Ireland on Thursday and it was amazing!! One of the best experiences of her life!! I am truly grateful for all your work and putting up with me and my thousands of questions, all my emails and phone calls. I had such a good time in Ireland!! Our tour guide, Cathal Clarke, was amazing! He was so informative and funny. We really enjoyed having him lead us! Also, thank you for being so helpful in the lead up to the trip and answering all my questions! We had good weather all week and I have been recommending you guys and Ireland in general to everyone. I just wanted to let you know how much my daughter and I enjoyed our trip to Ireland that we booked through Go Irish Tours. Katrina was so helpful. We gave her a list of the areas we wanted to visit and she came up with a great itinerary. We stayed in hotels, B&Bs, a castle and a manor house. All of the accommodations were wonderful. The B&Bs were all very clean with updated bathrooms. All had free Wi-Fi. The owners were friendly and offered suggestions as to dining and pubs. We were always close to the city centers and would park our rental car at the B&B and walk to everything we wanted to see. It was truly a vacation of a lifetime. Just want you to know we had a fabulous tour of your magnificent country, thanks in large to your efforts. Ashling Hotel was very convenient for Dublin access, and the food was good. Nowhere, however, compared to Hayfield Manor or Waterford Castle. Hayfield, boasting aMichelin Star Chef, is the epitome of a 5 star resort. Wonderful hotel! Waterford, employing the 2017 top chef in Ireland and only 19 rooms, was a real treat. You must be very proud of your fellow citizens. Very friendly! Sorry we didn't get to meet you, but we seemed to be very busy constantly. We made it hope safely last Thursday night after a great experience in Ireland. We would like to thank you for all your help and assistance in getting this trip planned. We know it took quite a few changes on your part but it was well worth it. It was also great meeting you as putting a face and personality to the voice is always better than just the voice! We were quite impressed with you, not only on the phone, but in person. Re the tour itself, Brian was the perfect choice for us. He had a great wealth on knowledge re Ireland, the places we went, and the things we saw while we were there. It was nice having the flexibility of the small group guided tour in the van. That allowed us, not only to experience what we had scheduled, but to have some other opportunities, primarily to Brian’s expertise, personality, and knowledge. In the future, we hope to be able to do this again so, rest assured, we will be contacting Go Irish Tours when that occurs. I have included some pictures in this email and can send additional pictures if you would like some. Again, thanks for everything, you and Brian are a definite “10” in our book!!! We wanted to write you a brief note about our trip … it was simply amazing! Five stars out of five stars. First and foremost, Dave N. is an exceptional guide. Donna and I also appreciate the amount of thought and logistics that went into planning our tour. Everything went just as we had hoped and without any unforeseen issues; the itinerary, accommodations, food, & the variety of things to see and do were all excellent. Dave did a fantastic job managing our time budget and expectations, checking ahead to make sure things on our itinerary were ready, finding us pubs, not to mention taking us places and explaining (sometimes interpreting) what it all meant. Dave is awesome. Five out of five stars for him too. We highly recommend your guided tour as the lowest stress, most efficient, and most informative way to tour Ireland. The weather was surprisingly good during our tour. We had several sunny days that really lit things up. The landscape was quite spectacular; and I’ve included one panorama photo. I think Donna’s favorite thing was staying the night at Ballynahinch Castle. It was really elegant and beautiful, the dining is great, and the view of the river is spectacular. We want to go there again!! She also really liked Kylemore Abbey and the Waterford Crystal tour. Besides those three, I really liked the Jameson tour at Midleton, and of course walked away with a bottle of Midleton Very Rare for cold Oregon coast nights. While in Dublin, we enjoyed our visit to Trinity College and the Guinness Experience – but I’m still practicing pouring the perfect pint (slow learner I think). We hope to return to Ireland in the near future to resume our journey, so we’ll be in touch. Thanks again for our excellent tour! Thank you so much for arranging our fabulous trip to Ireland. Neither Joy or I had been there before and so much appreciated your arranging for our car, and bed and breakfasts. You knew the driving distances, good locations and chose great places to stay! We loved the castles, historic sites, pubs, Irish dancing, music, shopping, scenery, etc. we especially loved staying at Loch Eske Castle! Thanks again! We would definitely recommend your services! We appreciated your being available 24/7 if we needed anything! Your services were very affordable and it was always a pleasure to speak with you. God bless you! I am just back in the states. We arrived on Saturday in the evening in Detroit. It's Monday now and I'm still feeling the jet lag, but it feels good alongside all the wonderful memories I have of the trip.I want to express in the most sincere way possible my thanks for all that you and Celine and everyone at your company have done in making this the best trip of my life....and to speak for the family on the trip, a very _______ (insert all sorts of positive adjectives here!) trip.I went into this trip with an idea of what I/us wanted to do, and the result was brilliant, mostly because of the flexibility of your company...and you and Celine. I know things changed quite a bit as far as who was going and where we wanted to go and for how long, and I always expected it was too much to ask for. But you all were very flexible and accommodating. I can't thank you enough and give you high enough praise for the positive experience we had in setting up this trip. The accommodations were outstanding!! Every place was first-class. Everyone was very friendly. The breakfasts were outstanding! Finally, I don't know how involved you all are in the driving company (in this case Hennessy), but we had THE best driver in Neil O'Huil. Please express all of our (and I speak for every person on the trip) deepest and sincerest appreciation to Neil (and his higher-ups). He was/is extremely professional, and extremely personable. He is a great person and we all feel lucky to have gotten the opportunity to meet him. My bro in law (Michael Cole) asked me numerous times on the trip ``did the tour company ask questions about who we are, in the effort to find a good match for the driver?`` And my answer was always ``no``. I hesitate to say we lucked-out in getting Neil because I don't mean no disrespect to other drivers, but we all really enjoyed having him as the driver. It's safe to say that he felt like family to us. We all got on quite well.As I transition back into life in the States (where it is currently snowing and very cold....grrrr.....), I am filled with the wonderful memories of the trip, which would not have been possible without you and Go Irish Tour's work....and for the ``luck of the draw`` of getting Neil as our tour/bus-driver. I will certainly speak highly of your company when advising others on travels to Ireland. We used Go Irish Tours on the recommendation of a friend and we’re very pleased with Katrina setting up the trip and Dave as our driver. Katrina was very easy to get ahold of and always promptly returned my calls. She was very thorough in setting up our trip with our many requests. We visited in January with our college age son who loves Irish music. Poor Dave had to endure the Irish winter, but was such a trooper covering our itinerary plus places he thought were worth making a little detour to see. As it turns out, the weather really isn’t that bad in January and we avoided crowds and traffic. Dave was very knowledgeable of Ireland and its history and made our trip most enjoyable. We enjoyed his never ending great pub finds for a daily stop for lunch as well as ones with great music at night. We loved this beautiful country and every day we thanked Dave for eliminating our stress by doing the driving. Please let people know how wonderful you are! Thanks again for being so kind and for planning our wonderful trip to your beautiful country! Katrina made all of our B & B, Hotel, and Car reservations for our thirteen day, self guided Irish adventure. Our trip was wonderful! All of the lodging choices that she made for us were elegant, clean, and comfortable! We were always greeted by friendly and helpful people when we arrived (everyone in Ireland was friendly and helpful)! Delicious breakfasts every morning! Go Irish Tours has a team that always aims to please. When I phoned them, I was always promptly greeted in person. No messages to leave or waiting on hold. Katrina and her colleagues are knowledgeable and always willing to``go the extra mile`` to make your trip as perfect as possible. We have never been treated better! We would recommend Go Irish Tours to anyone, without any reservations! Thank you Katrina and Team! I just want to take moment and thank Go Irish in general, and Celine in particular for all the help that was given. When I first decided to take this (our dream) vacation to Ireland, I had no idea where to start. Celine took the time to talk to me, find out exactly what I wanted to do, and planned accordingly. Even though I know it is not the case, I always felt like I was her only client; I always got very timely and direct responses to my inquiries, even if they were, possibly, dumb questions, i.e. I never had to wait more than a few hours, which is understandable with the time difference. The places that she booked for us were absolutely perfect! We had never traveled using B&Bs, but the ones she found for us could not have been better - from amazing views, to the hospitality, to the owners' friendliness and knowledge. It's like she knew exactly how we wanted are trip to be. 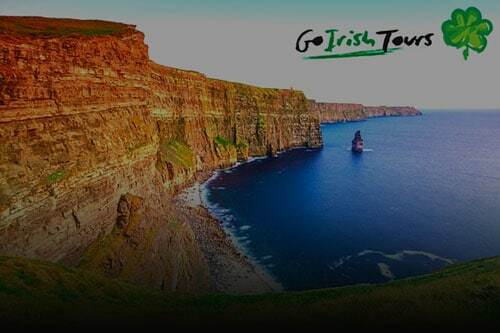 If, no when, we go back, we will most assuredly look up GoIrish Tours again. I have already recommended you for some of my friends wanting to travel abroad. Thanks again to Celine and GoIrish for an amazing, magical holiday!! We had a great time! Everything was set up perfectly and everyone was so nice and accommodating. We stayed in a few places in the cities and a few places in the country. Each place that Irish this booked for us was exactly what asked for. We loved having our own car so we could travel and do what please and it also saves money to have a car too. We would suggest this company to anyone looking for a little help with planning a trip! We had a wonderful time. I don't think we could have done more in 6 days if we had tried! And you made the perfect choices and honored all of our requests, right down to the B&B with a little farm! We loved every bit of it. We really loved the freedom of making our own way and spending as much or as little time places as we wanted. And though we planned a lot of our excursions, we had some surprises, like a sheep dog trial that we happened upon. It was exactly what I hoped for and the memories are cherished!!! I can't thank you enough. And we had no trouble with any of our accommodations during any part of it. The whole process was smooth and easy. Many thanks!! WE had a very nice trip to Ireland it was fun and it was nice to see some of the beautiful things that God has created . the ten days went by way to fast ,so happy we had Robert Allen as are tour guide and chauffeur . He was fun and he told us a lot about Ireland . I would like to come back another time I liked the tour that well. Every one in Ireland was nice and friendly people to us . Thank you Celine for setting it up for us ! Dan and I truly enjoyed our short and intense visit to Ireland in October. In 3 days we went from Dublin to Allihies on the Beara Peninsula so I could see where Dan’s ancestors mined copper before leaving this wild area to immigrate to the US. Then on to the Cliffs of Moher and back to Dublin to see Trinity College and the Book of Kells. Along the way we stopped to see Waterford Crystal made, I kissed the Blarney stone and enjoyed Bantry House and Gardens. On short notice, Go Irish Tours arranged for Robert to be our driver and guide. He made our crazy schedule work with his skill and great attitude. We wanted to write you regarding our September 2016 trip to Ireland. We spent two weeks on the self-guided driving tour and are so happy that we chose Go Irish Tours to plan our trip. From the first time I inquired about traveling to Ireland, Celine was very helpful. She answered all of our questions and put together a perfect itinerary based on what we wanted to see and do. She even made several changes prior to our trip based on changes in our plans. Every Bed and Breakfast that she chose for us was delightful. We felt very welcomed and experienced Irish hospitality and spirit first hand and every need was quickly met. Each host was always willing to offer information about the area and share a bit of the history. John at the Rocklands House B and B in Kinsale was fabulous. He was very gracious and helpful. He helped Andrea find the exact location of her grandmother’s place of birth and looked up the census from 1901 and 1911 leading us to the little village of Knocknagoshel. The food at each place was delicious with unique special touches everywhere. We are forever in love with fresh baked Irish scones and Irish Breakfast tea. The Brooks Hotel in Dublin was also an wonderful boutique hotel (also the Hairy Lemon pub next door)but perhaps our favorite place to stay was the Ballynahinch Castle Hotel. The grounds were spectacular and the rooms were stunning with an amazing view. The service was 5 star with tea service anytime delivered to your room or anywhere in the hotel. The restaurant there was some of the best food we have eaten anywhere, including a 5 course dinner with Chef choice extras. We loved being able to visit places at our leisure and even enjoyed the adventure of driving on the left, once we got the hang of it. The sheep and cows were most welcoming. We did pay extra to upgrade to a larger size vehicle which made us feel more secure. Some of our favorite tourist stops included St. Patrick’ s cathedral in Dublin and The Kylemore Abbey both filled with often unknown history. The Blarney Castle and grounds, the towns of Kenmare and Meath were also lovely as was each town we stayed in. We cannot say enough about all of the great pubs we landed in as well as the people we met at each stop. We are already talking about our next trip. Thank you again and we have already recommended you to several people. We wanted to take the time to thank you for the amazing trip that you planned for us. Cindy and I had planned on going to Ireland for 27 years, it seemed like something always came up, as it usually does with life! This year we finally made it happen, it was everything we expected and much more. Sixteen days were not enough, and the only disappointment was having to leave. The only thing better than the gorgeous country are the truly gracious people of Ireland, they make you feel at home! Thanks again, the hotels you picked for us were spot on, beautiful and very relaxing.